Bordering the Great Rift Valley and sandwiched between Africa, Europe, & Asia, Israel is not only the crossroads of history but is a land bridge for plant and animal life; every year millions of birds migrate over Israel. Add to this the Sea of Galilee, Dead Sea, Red Sea, landscapes from snow capped Mount Hermon to red sandstone desert, and great weather, and you have a hiking and camping paradise! 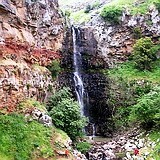 Israel’s mountainous landscape is crisscrossed by narrow canyons and gorges that are easily accessed for great hiking and nature: Waterfalls, natural pools that you can swim in, unusual rock formations, rich plant and animal life. There are magnificent water walks for all ages – a great respite on hot summer days while touring around the country. 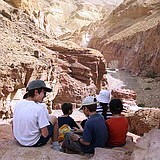 If you enjoy campfires and sleeping under the stars, the Negev Highlands is a wonderful setting. We may even sight some ibex, gazelles, and foxes! Make a camel trek or jeep safari. Another option is to camp at a regional park by the Mediterranean, listen to the lapping of the waves at night, and take an early morning walk along the seashore – to discover this unique habitat. 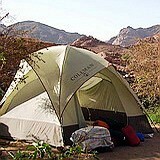 Interested in more information about camping or hiking in Israel? Contact Zack Shavin, veteran guide & biblical archaeologist at Land of Israel Tours.